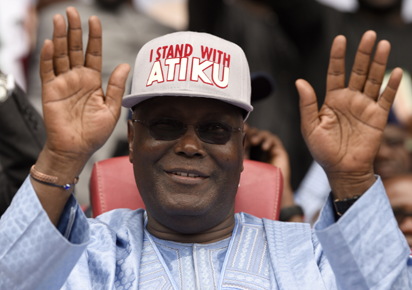 Port Harcourt- Presidential candidate of the Peoples Democratic Party, PDP, in the 2019 general elections, Alhaji Atiku Abubakar has been advised to pick his running mate from the South West geo-political zone or perish the thought of securing the support of its people at the polls. Former Nigerian vice-President Atiku Abubakar raises his hands after winning the presidential ticket of the opposition People’s Democratic Party (PDP) during the party’s national convention in Port Harcourt, Rivers State on October 7, 2018. Nigeria’s main opposition Peoples Democratic Party (PDP) has picked Abubakar to challenge President Muhammadu Buhari who is seeking a second term in presidential polls scheduled for February 2019. / AFP PHOTO / This advice is coming 48 hours after the former Vice President beat eleven others at a special national convention in Port Harcourt, to emerge the party’s flag bearer. A PDP chieftain of South West extraction and member of the convention planning committee told our correspondent in confidence late on Sunday night that the advice became necessary in view of the “ill treatment,” meted out to the zone by the party in recent times. According to him, the entire PDP family is ready to work tirelessly for the victory of the party, adding however that equity must not again be glossed over in picking the running mate on the party’s Presidential ballot. Bemoaning what he described as “the denial of the South West the position of the national chairmanship of our party,” in the December 2017 convention; the PDP bigwig said should the zone be looked over again in the choice of a running mate; it would mean that equity and fairness no longer mean anything to the party. He said: “Now that we have a candidate to challenge President Muhammadu Buhari in 2019, we must be fair to the South West which has been taken for granted in the scheme of things for quite a while now. Anything short of the Vice Presidency slot will not be acceptable to our people. “Last year, a lot of intrigues played out at our convention and we were denied the opportunity to produce the chairman. A prominent Nigerian and one of our leaders, Bode George backed out of the race and a few others who couldn’t comprehend what was going on left for other parties. “But we stayed on and were able to prevail on our people to have faith in the party. Now that the convention has come and gone, I advise our candidate to pick his running mate from the South West to win majority of our people’s votes.” He advised the ruling party to demonstrate sufficient faith in democracy by conducting a variant of the Port Harcourt convention for a start. He noted that for not pushing the consensus option, the leadership of Prince Uche Secondus has shown that democracy is “alive and kicking in the party.” He added: “They shut the doors against others just to affirm President Buhari obviously for fear of the unknown.